Hair follicle dilatation-ectatic hair follicles with intraluminal keratin (arrows) in a male B6C3F1 mouse from a chronic study. Epithelial cyst-flattened squamous epithelium surrounding a core of inspissated keratin in a male B6C3F1 mouse from a chronic study. 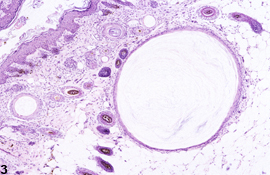 Epithelial cyst-ruptured cyst lining and resulting granulomatous inflammation in a female B6C3F1 mouse from a chronic study. Dilatation of hair follicles ( Figure 1 and Figure 2 ) may be observed as treatment-related lesions. Dilated hair follicles often contain small amounts of intraluminal keratin. 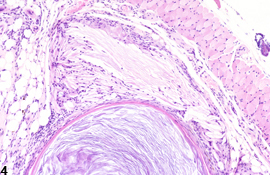 The lining follicular epithelial cells may be flattened. Hair follicle dilatation tends to be multifocal to diffuse, whereas epithelial cysts most often occur as focal, solitary lesions. 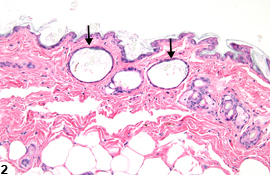 Epithelial cysts ( Figure 3 and Figure 4 ) are often spontaneous findings in rats and mice. Terms that have been used synonymously with epithelial cyst include epidermal inclusion cyst, epidermoid cyst, and follicular cyst. 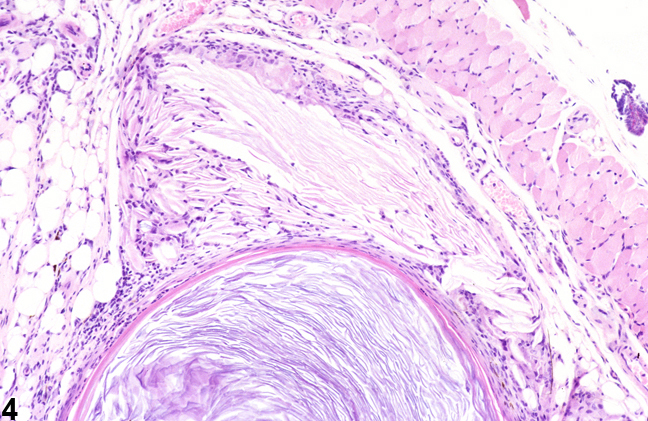 Histologically, epithelial cysts are characterized by a flattened squamous epithelium surrounding a core of variable amounts of inspissated keratin. They are proposed to arise from components of injured pilosebaceous units in which squamous epithelial cells producing keratin are trapped. 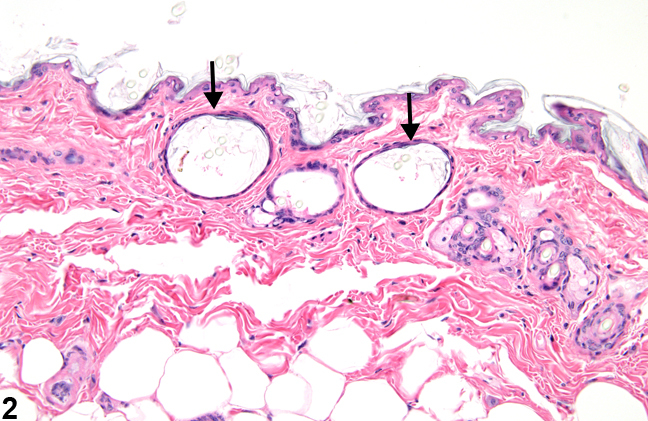 As keratin accumulates to form the cyst, the lining epithelial cells undergo pressure atrophy. Occasionally, the cyst lining ruptures and keratin escapes, resulting in secondary inflammation ( Figure 4 ). Whenever present, cysts should be diagnosed and documented as present but should not be graded. Cysts in the skin should be diagnosed as “Skin – Cyst”; no modifier is necessary. Findings that are secondary to a large or ruptured cyst, such as inflammation or fibrosis, need not be diagnosed but should be described in the pathology narrative. Elwell MR, Stedman MA, Kovatch RM. 1990. Skin and subcutis. In: Pathology of the Fischer Rat: Reference and Atlas (Boorman GA, Eustis SL, Elwell MR, Montgomery CA, MacKenzie WF, eds). Academic Press, San Diego, 261-277. Ramot Y, Nyska A, Lieuallen W, Maly A, Flake G, Kissling E, Brix A, Malarkey DE, Hooth MJ. 2009. 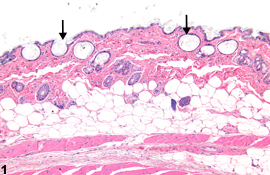 Inflammatory and chloracne-like skin lesions in B6C3F1 mice exposed to 3,3',4,4'-tetrachloroazobenzene for 2 years. Toxicology 265:1-9.